A vociferous advocate for correcting the literature — who has been banned by two publishers for his persistent communications — has asked journals to retract one paper and correct three others for duplications. consistent with my message to other plant scientists about correcting their literature when errors are known, I have immediately taken the following steps, on the same day that I received these reports (i.e., today). 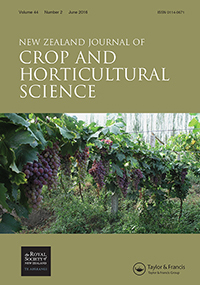 Teixeira da Silva noted that he has requested that the New Zealand Journal of Crop and Horticultural Science (NZJCHS) retract “Evaluation of carbon sources as positive selection agents for chrysanthemum (Dendranthema × grandiflorum) transformation,” which has been cited four times since it was published in 2004, according to Thomson Reuters Web of Science. That paper, according to da Silva, is a duplicate of another 2004 paper in Bragantia, “The effect of carbon source on the in vitro organogenesis of chrysanthemum thin cell layers,” which has also been cited four times. In this case, I sent an email to the EIC, Prof. Kevin Davies, offered an explanation, a sincere apology, and the request to immediately retract this paper. We’ve contacted Teixeira da Silva to ask if he could share the explanation for how the duplication occurred; he declined to comment. Teixeira da Silva is well known to many in the publishing world for tirelessly railing against perceived misconduct by other researchers — often for duplications — and exasperating editors who don’t meet all his requests. I wish to offer my apologies to any readers or chrysanthemum scientists who may be hurt by this fact. I have disappointed myself and this has been a very terrible and painful day, over and above the so many other conflicts that I am involved with, and that many of my critics at PubPeer and Retraction Watch are aware of. No matter how disgraceful or painful, I hope that setting my own publishing record straight will spur other plant scientists, those listed above and others, to do the right thing, and to act immediately to correct the literature when errors are reported, or detected. Although this shocking experience for me will no doubt involve a phase of serious introspection, and most likely a reflection on what science means to me after a lifetime of painful struggles to do the right thing, it will not prevent me from continuing to highlight what I believe to be a field of science in crisis, namely plant science, especially horticulture. I promise today that I will also be publishing a post-publication peer review of the chrysanthemum literature, in which I will be critical both of my own papers, and of other papers that have still not been corrected, even 2 or 3 years after alerting authors, editors and publishers to these issues. In addition, most likely the same astute reader reported figure duplication in three papers, all published in 2003, one of which was a review. All were published at the same time and it would have been impossible to cross reference the figures since the papers themselves had not been published. Fortunately, I have been given this opportunity to correct the affected papers. First, “Chrysanthemum organogenesis through thin cell layer technology and plant growth regulator control,” published by the Asian Journal of Plant Sciences, which doesn’t yet appear to be indexed by Thomson Reuters Web of Science. Here is thread about the paper on PubPeer. And finally “Thin cell layer technology for induced response and control of rhizogenesis in chrysanthemum, published by Plant Growth Regulation; it’s been cited 19 times. Dr Teixeira da Silva offers apologies to the editors and readers of the Journal. As requested by Dr Teixeira da Silva, we are now retracting the article. We note we received, peer reviewed, accepted, and published the article in good faith. Why would an individual submit an article to two different venues less than one week apart and change nothing but the title? How could they later be “shock[ed]” about such a duplication? JATdS’s contrition here is thoroughly unconvincing, especially since he is correcting the record only after his “errors” were exposed. Glass houses, chickens roosting, etc…it is tempting to crow. But is it not so often the case that zeal arises because the “crusading” individual has seen the same monsters within, whether they have bled through to the outside world (as we see here) or have not? Are JATdS’s accusations less valid because he has struggled and (as it seems) transgressed? Perhaps not less valid, but it could be he is no longer an ideal spokesperson for the principles he claims to uphold. One might hope that these revelations will be followed by more circumspect and thoughtful behavior by JATdS…but hopefully not complete silence, for bringing transparency and reproducibility to the scientific enterprise requires all sorts of bedfellows, plumbing the devious possibilities of the desperate human mind. One hopes that Clare Francis’ Westerns are immaculate. Re: the glass house reference: Granted that no one is perfect, but honest scientists don’t live in glass houses. And what you might call crowing is really just the expression of utter disgust at what appears to be staggering hypocrisy. I was one ‘astute reader’ detecting such duplications, and it should be made clear that the retracted article is not an exact duplicate of the other one. The narrative and layout of images is slightly different, as some wording, i.e. a different version of the same but submitted elsewhere. The other corrected papers repeat same images and results in a mosaic, often in a different context. Perhaps there further issues than initially reported, if other readers would like to double check. For me, the situation is simple: if you have more than 800 publications (https://www.researchgate.net/profile/Jaime_Teixeira_Da_Silva), it is very hard checking them all for mistakes, duplications or any other kind of problems. If it is just a matter of amount I just hope that, from now on, JATdS spend less time blogging and more time revising his prolific contributions in predatory/obscure journal to set the record straight. Copy-Paste: 2-Click Step to Success and Productivity that Underlies Self-Plagiarism. Sci Eng Ethics. 2016 Jul 6. [Epub ahead of print] No abstract available. “If it is just a matter of amount I just hope that, from now on, JATdS spend less time blogging and more time revising his prolific contributions in predatory/obscure journal to set the record straight”. I really expect the same! Don’t forget that his publication count is (or at least should be) now less by a few, however unofficial that may be. Who knows, maybe it will drop lower upon closer scrutiny of his publication record. I totally agree in that one may expect many questionable issues inside a mass of technical papers spawning from the same author and source place. Given that producing one sound piece of technical literature demands open-ended hours of literature search, critical thinking, and proof-editing, I believe one can only advance into hundreds-order of magnitude by embracing questionable caveats around traditional principles, e.g. authorship, reliability, preciseness, originality. JATdS likes to talk but, so far, no word from him. Who knows, he could be just anyone in this anonymous discussion. This in fact is a main intrinsic issue of anonymous discussions — one must never forget the fact that there is one actual person, complete with interests and biased intent, behind every word. et tu quoque Jaime fili mi!